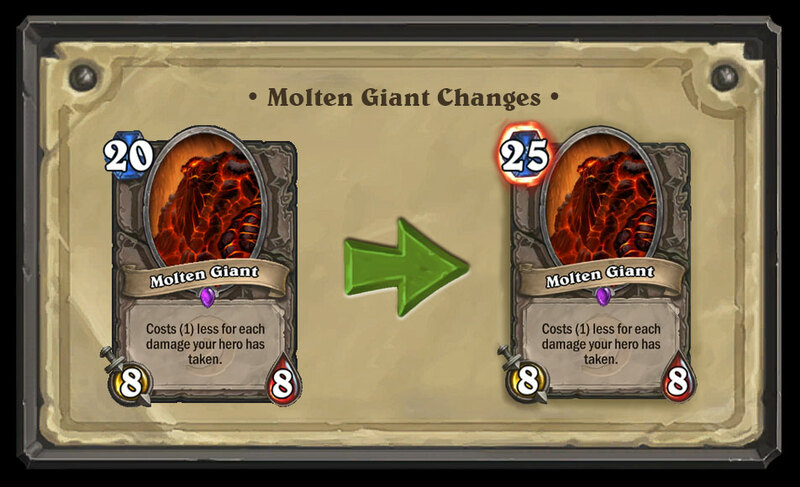 The expansion was announced to be released on April 26, this was also the expected date that nerfs would roll in. However, the nerfs went live on April 24, which was pretty shocking for most people. I will be discussing each card and my thoughts on the nerfs. 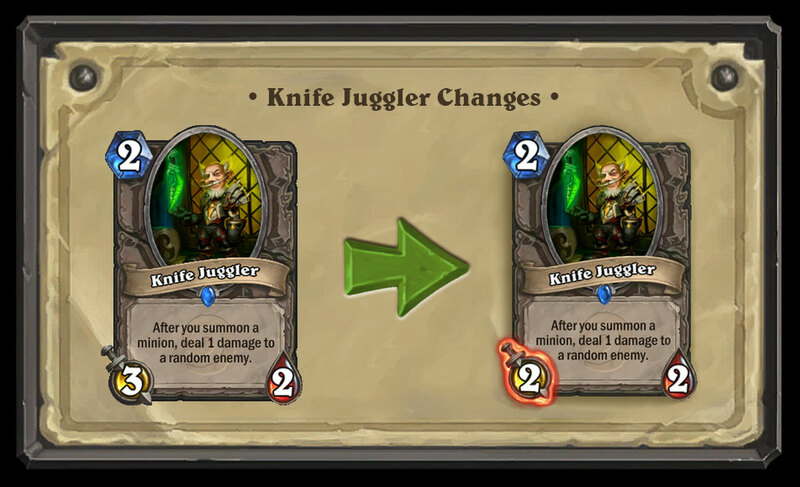 The change to Knife Juggler was that it got its attack reduced by one, personally I thought they would be a lot more harsh on the Knife Juggler nerf. I was expecting something like a mana increase to at least 3 mana. The attack reduction isn’t as big as an impact as the effect is still strong and just as RNG as it used to be. There will still be a lot of frustration over this card. It will trade into less things, but that isn’t really the main reason for playing this card. It was generally used along with token generators to ping off minions and push for damage. I don’t think this nerf was completely necessary, but it does make a slight difference that can definitely add up during games and make aggro decks a bit weaker. 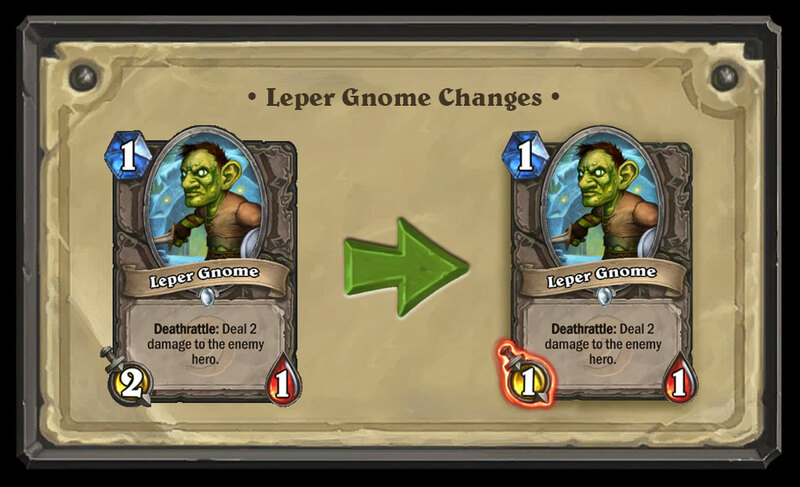 For example you may play a Leper Gnome on turn one and it hits on turn two. Your opponent if they have a ping ability will probably remove it by then. This means it will deal 4 damage if it was a Druid or a Rogue, plus the deathrattle damage making it 6. This is already 1/5 of your life total which can be pretty scary against aggro decks who do play Leper Gnome. This would be a lot worse for the other classes that don’t have access to a ping or any spell to remove it early. Arcane Golem was used primarily in aggro decks, but also as a combo finish in Reno Lock. 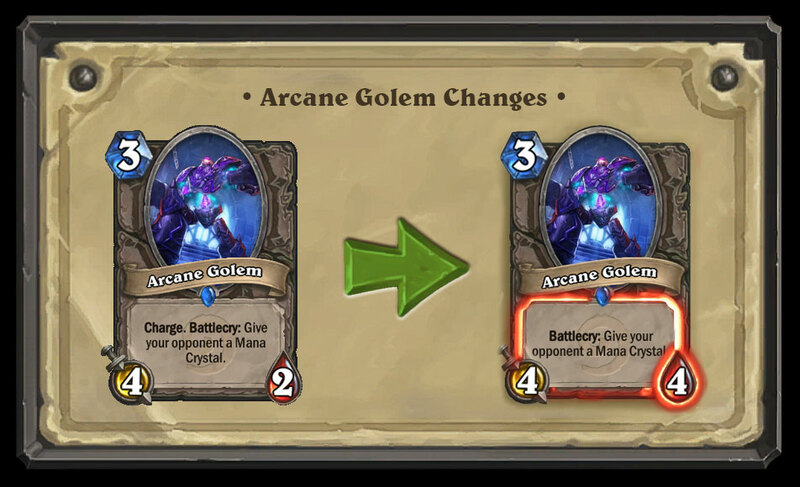 The change to the card makes it a minion that gives your opponent a mana crystal and does not give it charge in return for a 4/4. I don’t think this card will be seeing play because the stats aren’t worth the mana crystal you are giving your opponent. It was used in aggressive decks to dish out more damage, the fact that it had charge made it worth to play. Sometimes giving your opponent an extra crystal wasn’t too bad due to the fact that it sometimes doesn’t make a difference in regards to what their play would be. For example, giving a druid 8 mana instead of 7 rarely makes a difference as they would be planning to play a 7 drop anyways. There are a lot of variants to Reno Lock, however, the ones with a combo finisher will now most likely be running Leeroy instead. Some people preferred the golem due to the fact it costed less which means you don’t rely on Emperor Thaurissan. This is the case for Leeroy as you need at least one tick on one part of the combo to be playable. Molten Giant saw a lot of play in Warlock decks, traditionally Handlock and now a single copy in Reno Lock. There were many times you could get a crazy swing turn by having a low cost giant and playing a taunt giver, a Shadowflame or just play a giant for low cost while developing other threats along with it. At 15 health you were able to play a 8/8 for 5 mana while also doing something else that turn. 15 health was reasonably safe against most decks, it is one damage from dying to the old Druid combo with no minions. The increase in cost makes it so that even at 15 health you can only play this giant for 10 mana which makes the card not as great as it used to be. Blizzard justified the card by saying that a lot of the burst damage is getting nerfed, however, there are still aggro decks that can chip away at your life total while you try to play a cheap giant. I don’t think this card will really see play. Master of Disguise, probably a card that most of you have never heard of. The only recollection of the card I have from seeing it in competitive play was when Firebat brought it into a tournament one time. What changes did they make, well now it only gives Stealth until your next turn rather than when you decide to reveal it. This card could have potentially be strong in cards that buffed C’Thun while it couldn’t be killed, Twilight Elder is a neutral that buffs at the end of your turn. Master of Disguise could potentially have also worked really well with Scaled Nightmare as it gets stronger each turn and if you could hide it, it could be a pretty scary minion. 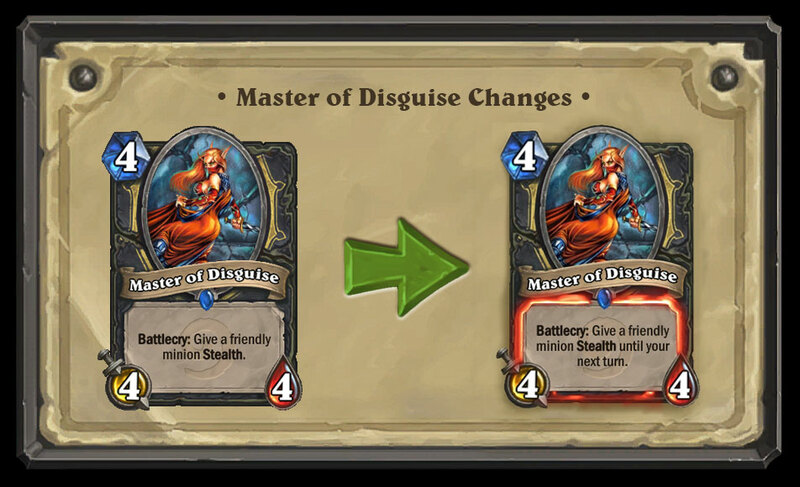 I guess Blizzard testing found the old Master of Disguise too good not to nerf. 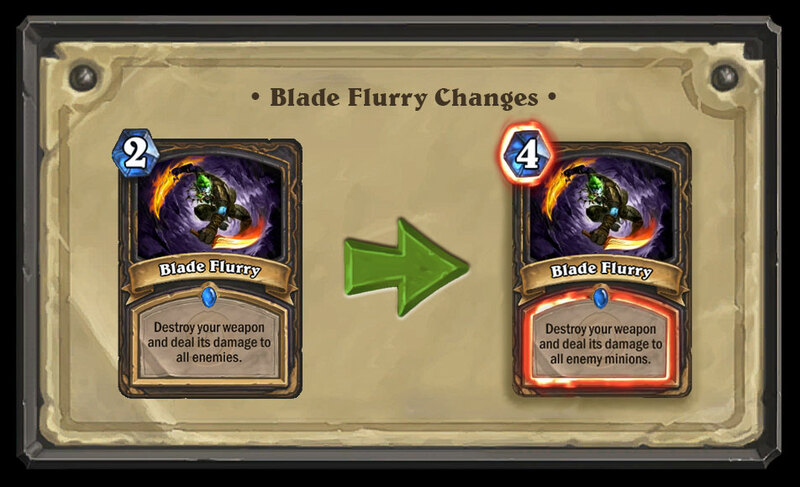 I didn’t really expect to see this nerf, one of my favourite decks to play is Oil Rogue and with Tinker’s Sharpsword Oil getting rotated out I didn’t think they would touch Blade Flurry. I was suprised that they increased the mana cost and changed the card text to only affect minions rather than all enemy characters. I would’ve thought that it would be one or the other. Blizzard says that they are pushing towards a different type of Rogue, however, Blade Flurry is one of their primary board clears which seems like it’s going to be harder for Rogue to stay as a strong deck. The card might still see play as it is one of two board clears that have been played in Rogue decks, but it feels pretty bad from what it used to be. Ancient of Lore was an amazing card that let you have a lot of flexibility. You could choose to use the healing effect against aggro or getting you out of combo range, since in some scenarios you had all the cards you needed to answer threats or win the game. You could also choose to draw 2 cards which is great for a deck that looks towards certain cards to push for lethal damage. The effect got nerfed to 1 card draw if you chose it, which is a lot worse than before. It might still see play as Druids don’t really have great card draw, people are saying that Azure Drake is better, but you are limited to 2 copies per deck and most decks are already playing 2. 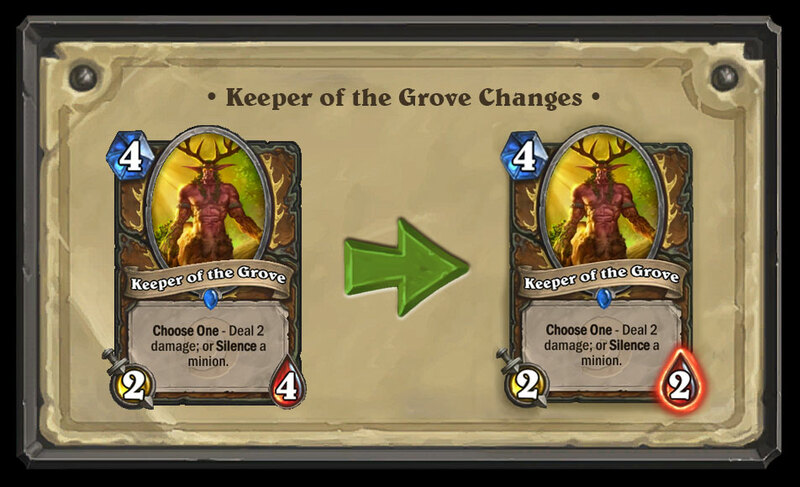 I think Ancient of Lore will still see play, especially since they introduced the Druid legendary, Fandral Staghelm, it makes all Choose One cards have both effects combined and has decent stats for a 4 drop, a 3/5 minion. 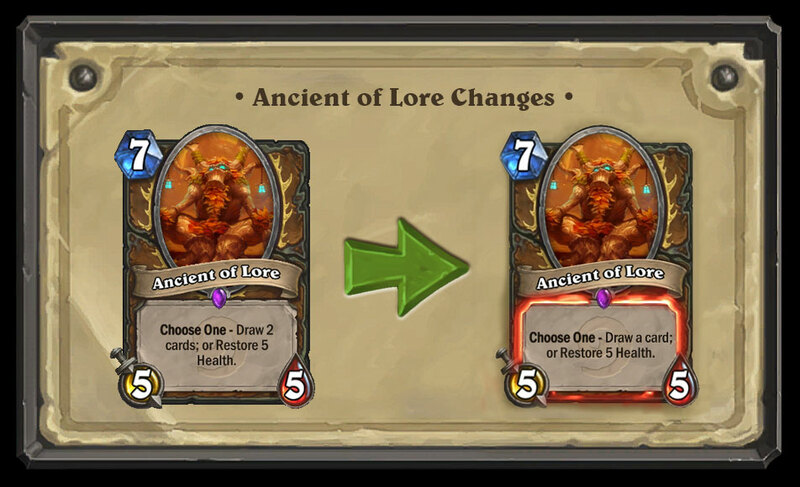 Blizzard stated that they were looking to change from the combo Druid we all loved into a more beast oriented deck. 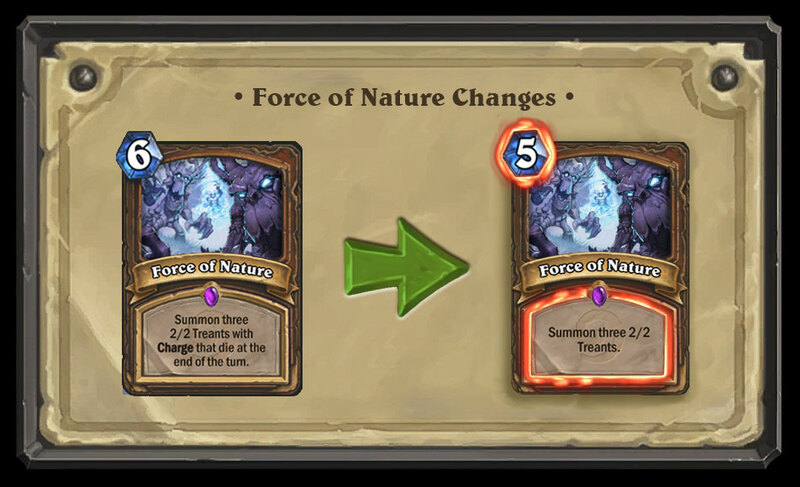 This change to Force of Nature brings a huge nerf to the famous combo as it does not have charge anymore, although the minions do survive. I expected out of the two combo cards, Savage Roar seemed like it was likely to get nerfed because it is the stronger of the two. Savage Roar scales really hard with the amount of minions you have on board and does a lot more for its mana cost than Force of Nature did. Maybe we will be seeing a resurgence of Token Druid with this new card effect. The decreased mana doesn’t make it that great of a card. This card will probably not see play in the competitive scene for a while, until someone makes good use of it, which may never happen. A Beast Druid without Force of Nature seems quite likely and may be what Blizzard wants for the future of the class. 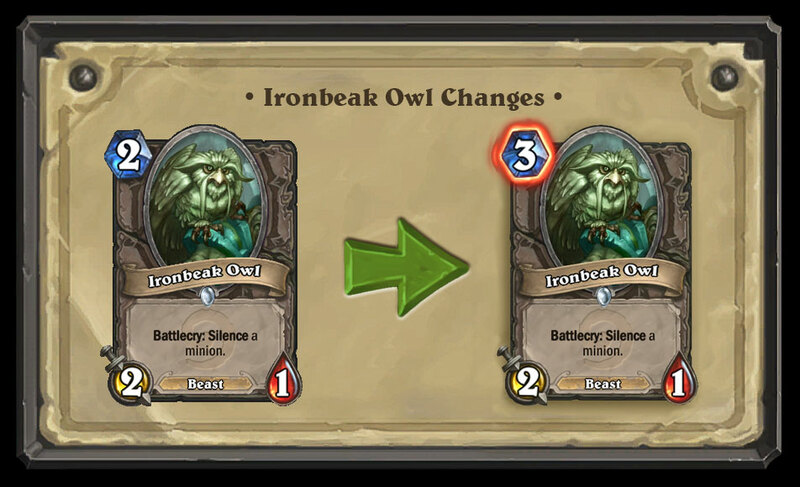 Another Druid card that got nerfed, Blizzard nerfed two classic silence cards, the other one being the Ironbeak Owl which we will touch upon later. The flexibility of this card is quite insane as with a lot of the “Choose One” cards. You were able to deal with a lot of aggressive minions with the 2 damage. You were also able to silence threats and make clearing the board a lot easier. The card still keeps both of these effects, except now it’s health has been reduced to 2, from 4. This means that against aggro decks it will wipe out a minion, but it will be likely to die the turn after Whereas, pre-nerf it could use it’s effect then kill a couple minions before dying. This card will probably see play due to it’s flexibility, however, it does seem a lot worse especially if there is a large population of aggro decks running around on ladder. The second silence to be nerfed, this card was one of the most hinted cards to get nerfed. There were a lot of speculations and a lot of players talking about how silence affects the game. An increase of mana cost means it will cost more for aggro decks to push through taunts, it also means that some control decks may be playing Spellbreaker instead due to its body and the fact that it only costs 1 more mana. Ironbeak Owl will probably be used in aggro decks, whereas the body may be more important in other types of decks than the mana usage. 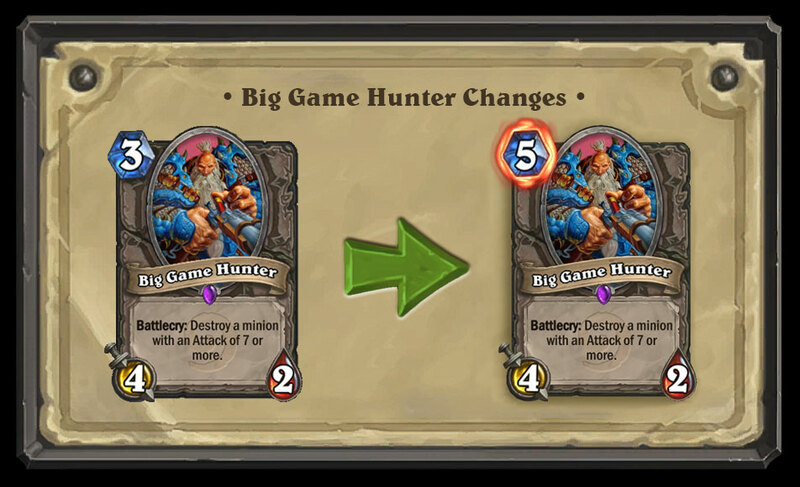 Another anticipated nerf, the Big Game Hunter was a primary removal card against big minions such as Dr. Boom. I think that the card is needed in the game to keep large minions in check, however, the 3 cost variant was way too cheap for what it did. At 5 mana, it seems a lot more fair that you can’t develop a 7 drop along with it while removing your opponents.I think this card will still see play, you are still getting rid of a large minion with the effect, just at a higher cost now. The swing is still there, just not as big as it used to be. 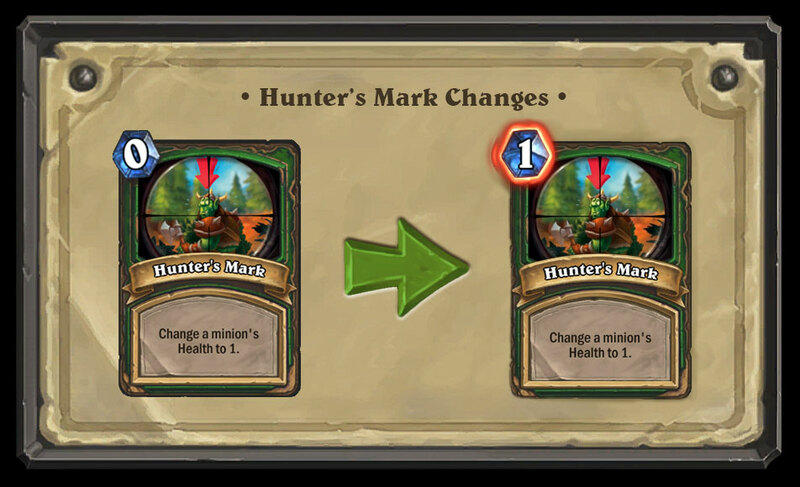 Although Hunter hasn’t been played in a lot of the meta game recently, there have always been talks about changing the mana cost of this card to 1. A 0 mana card that reduces the health of a minion to 1 is pretty insane, so I can definitely see where Blizzard is going with this. This card will still see play in Midrange and Control Hunter decks, especially with nerfs to silence.